Home > Blog > Capital CDC Supports New Community Park with a $2,000 Grant! Capital CDC Supports New Community Park with a $2,000 Grant! In 2014, Capital CDC’s Timothy Schwader, a Highland neighborhood resident, learned about the plans to create a community park at a Highland Neighborhood Association meeting. Timothy approached the Association to see how Capital CDC could assist in funding a community park, and was introduced to Marla Schmitz, a Highland neighborhood resident who was leading the effort for a local park. The City of Austin approved funding for the Highland Neighborhood Park after well over a year of discussions, meetings, and votes – all spearheaded by Marla, who continued to devote all of her available time to the project. On July 4th 2015, Capital CDC’s Thomas Braasch, Paula Dean, and Timothy Schwader attended the Highland Neighborhood Associations' annual Fourth of July neighborhood picnic. For the first time, this was held at the grounds of the new Highland Neighborhood Park – adopted by the association as "Friends of Highland Neighborhood Park"! 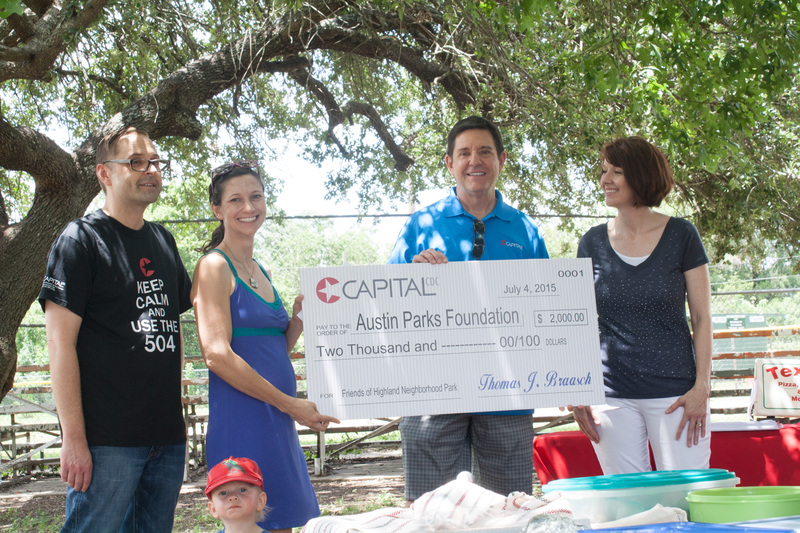 Capital CDC presented a check to the Austin Parks Foundation, a non-profit organization devoted to building public and private partnerships to develop and maintain parks, trails, and open space in Austin and Travis County, for $2,000 – a grant that will turn into $6,667 through a cost share program under the City of Austin. Highland Neighborhood Association President, Alex Schmitz, was extremely grateful for Capital CDC's grant and said, "We are still a few months out from community involvement in the master planning project, but we know that with generous donations like the one from Capital CDC, we are on our way to our dream park!" The City of Austin is currently in the process of choosing a firm who will master plan and design the new park. The Highland Neighborhood Association anticipates that the community will begin participating in master planning in the next several months, providing input into the amenities and aesthetics of the park. They plan to hit the ground running when master planning is done, with the hope that their children will be able to enjoy all that Highland Neighborhood Park can offer while they are still young.